As the number of Ebola cases in Sierra Leone is poised to exceed 10,000 by the beginning of next year, there is growing fear that the yet to be constructed holding and treatment centres will be swamped. 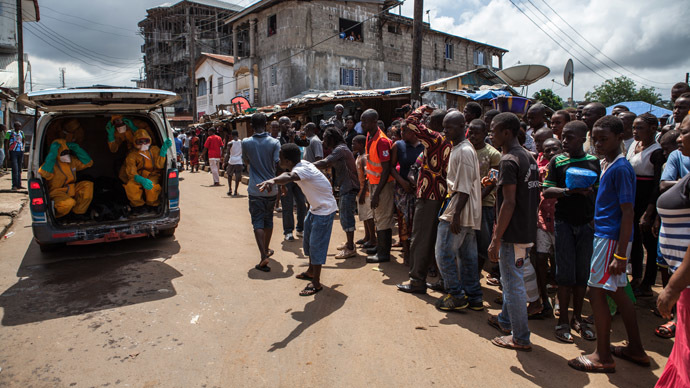 Sierra Leone currently has about 300 Ebola holding and treatment beds. Immediate demand is estimated at 3,000 beds. 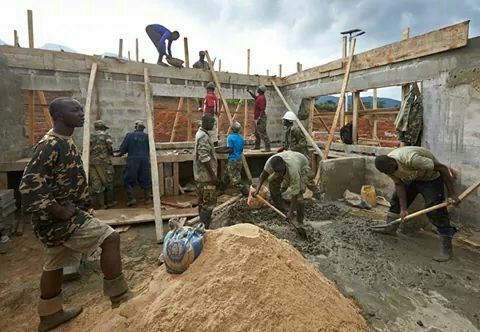 The planned completion of four newly built regional centres by the British before February 2015, is expected to bring into deployment 750 additional beds in the country – 2,250 short of the estimated 3,000 new beds needed to cope with the crisis today. But the arrival of about 400 British troops in Sierra Leone, so far is making a huge difference to the population’s sense of hope of any chance of Ebola being defeated. The battle may have started, but the real war on Ebola is yet to begin. An additional one battalion of British troops will arrive early next month by sea, carrying tons of supplies of much needed protective wear for the country’s health workers and burial teams, many of whom have already started receiving vital training from the UK troops on how to keep themselves and their communities safe. But the death of hundreds of Sierra Leonean health workers and doctors, has left a massive vacuum in the capacity of the country’s health systems, as the worsening humanitarian crisis continues. Although dozens of ambulances and pickup trucks have been deployed by health agencies across the country, however, the exponential rise in the number of deaths and new infections is putting intolerable strain on logistics. Yesterday, the UN and the World Bank said that they are jointly responding to meeting the growing and desperate need for more vehicles and access to food supplies. 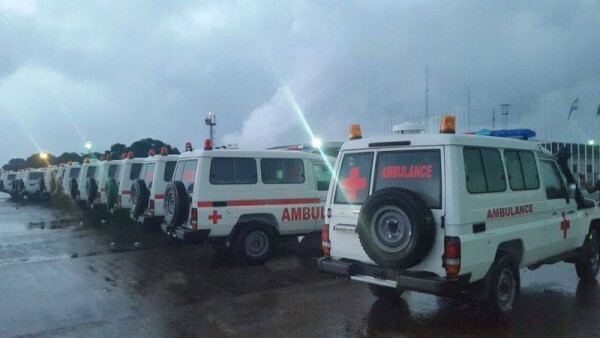 With World Bank funding to the government of Sierra Leone, the United Nations World Food Programme (WFP) has airlifted 20 ambulances and 10 mortuary pickup trucks to scale up the government logistical capacity in response to Ebola. This delivery constitutes the first set of 74 vehicles worth US$4 million to be brought in by WFP from its hub in Dubai to Freetown. The remaining 44 vehicles are expected in Freetown by sea in the forthcoming weeks. This follows a memorandum of understanding between the government of Sierra Leone and the UN Agencies to implement the US$ 28 million World Bank-funded Ebola Response Project, of which US$ 9.5 million was allocated to WFP to deliver food and non-food items. As of 20 October 2014, WFP has already reached more than 300,000 Ebola-affected people in Sierra Leone with 4,000 metric tons of food. These include patients in treatment centres, survivors, quarantined families and communities. The World Bank partnership with government and the UN Agencies is part of concerted efforts to stop the rapid spread of Ebola Virus Disease in Sierra Leone. It seeks to scale up the country’s logistical and operational capacity and mitigate the economic impact on affected communities. “We have been hearing alarming stories of Ebola patients going helpless for days in their homes and villages due to logistical constraints. “I hope these ambulances will contribute to alleviating the suffering of many families and curbing the spread of the disease,” said Gon Myers – WFP Country Director, speaking at a handover ceremony in Freetown. Reports from the National Ebola Response Centre (NERC) show that emergency calls to the Ebola response centres have increased from 300 calls per day in early September to more than 1,400 calls per day in October. About 80 percent of these calls require immediate follow up actions to see a sick person or take a suspected Ebola case to the nearest health centre. But it takes several days to get a response, due to logistical constraints and shortage of medical personnel. The World Bank Acting Country Manager – Yusuf Bob Foday, said; “The health workers are on the frontline of the battle against this outbreak, fighting a dreaded disease that appears to be taking the upper hand. We cannot allow the morale of these brave doctors, nurses and volunteers to be broken because of lack of logistics. “We must therefore provide them with what it takes to carry on with their work, to continue to save lives and to win this battle. Since the outbreak of the Ebola Virus Disease in Sierra Leone, WFP has been supplying key technical assistance including construction, storage, procurement and transport, particularly to medical partners to ensure the best possible humanitarian response to the health emergency. WFP also provides air transport to ensure movement of humanitarian aid workers and equipment within the three Ebola-hit countries. To ensure continued assistance over the next six months, WFP requires a further US$24 million for its Ebola emergency operation in Sierra Leone. The WFP is the world’s largest humanitarian agency fighting hunger worldwide, delivering food assistance in emergencies and working with communities to improve nutrition and build resilience. In 2013, WFP assisted more than 80 million people in 75 countries.